Our joint Yattendon & Frilsham village fete is held in Yattendon on the late May Bank Holiday Monday. The roads through the village square are closed to traffic and there is so much going on in the Manor Barn, the Square, the Village Hall, the tennis courts, the green behind the barn and all the spaces in between. This annual event is very well attended by people from miles around and is a major fundraising event for all the village buildings, clubs etc. We are always surprised and delighted that even though we occasionally have less than perfect days for the fete, everyone turns up nonetheless. 2017 was, unfortunately, one of those years! We battled rain, the Reading playoff and the road closures but still had a great day out. 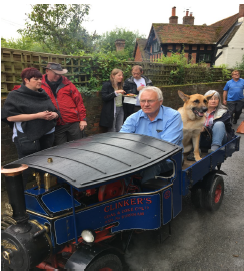 Once again, there were a few new attractions such as the Fish and Chip van and the mini steam train and we welcomed back the Raffle and the Produce stall. The Men vs. Women Cake Competition, again decided by Lady Iliffe, Rev. Meg Kirby and Mrs Emma Slack, caused a bit of an upset when all three place holders were women. 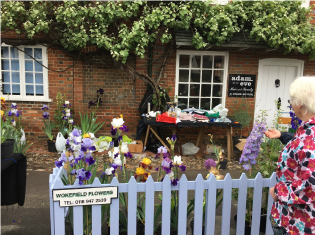 Well done to Laura Major , who was placed 1st and whose name will appear on the new trophy in Yattendon Village Hall. 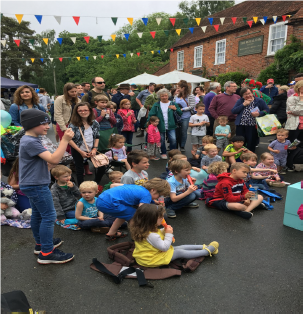 We raised £20,000 this year, which given the damp day, was a terrific effort - so thank you Yattendon and Frilsham for supporting the fete once again. Beechwood Farm for donating all the eggs for Egg Throwing - thanks Rachel! 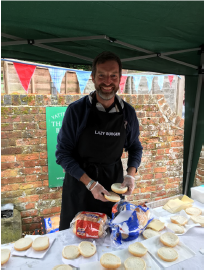 Chris Mills (pictured below) and his dedicated team of BBQers - not a single burnt burger again this year! And all of our many helpers, especially the team from 1st Cold Ash Scouts who help out wherever they are needed. There will be more details of the profit later after the Sports and Social Trust have fully decided on the allocation of the fete funds. However a huge thank you to everyone who came for a great, if slightly damp, day!